Did you know that if your ferments are too close together, you'll experience cross-contamination? …but if different types of ferments are too close together, weird things will happen! Like “fluffy” cheese, yeasty or alcoholic-smelling vegetable ferments, and funky tastes. So, how far apart should you keep your ferments? Which ferments are important to space apart and which don't matter? What if your kitchen is too small to keep them far enough apart? Check out the particulars below in print, podcast, or video. The Question: How Far Apart To Space Your Ferments To Avoid Cross-Contamination? I am newer to fermenting but am absolutely loving it! I've learned so much from you! 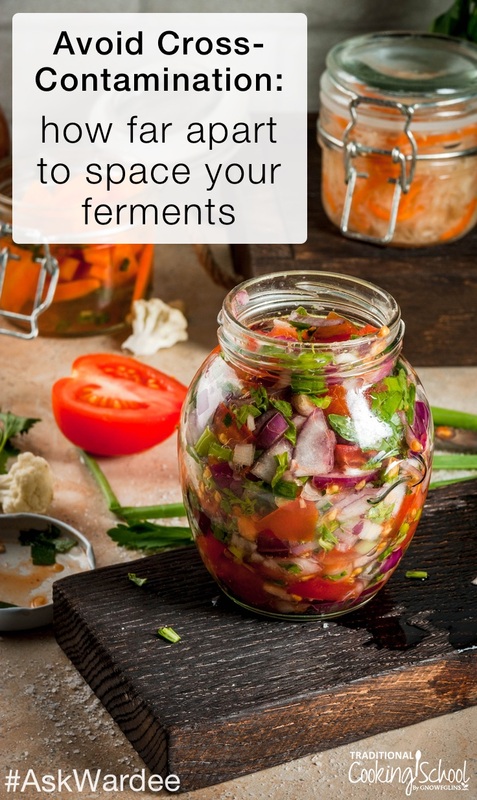 I've heard you say a few times that you need to keep your ferments separated by about 4 feet (I think that's right?). I would love to know more about this. I don't have a very big kitchen, so keeping my water kefir away from my kombucha and sauerkraut is getting challenging. Would a shelving system be okay to keep them separated, or is that just not enough space? Thank you so much! May God richly bless you! Laurie, it's correct that the “rule” is your ferments should be 4 to 5 feet apart. This prevents cross-contamination of cultures, where yeasts and bacteria are getting into nearby containers. There's a cloud of microscopic activity surrounding our ferments. When the “cloud” around one container gets close to another's cloud, the organisms share vessels. They hop back and forth. It's kind of funny to imagine, isn't it? So, it's important to keep the different “types” of ferments spaced at least 4 to 5 feet away from each other. If you have 2 ferments of the same “type” — say pickles and sauerkraut — they can stay close together. You can keep different souring doughs near each other. And, it's ok keep different cheeses near each other. In my opinion, though you may get some culture-sharing within types, the results are not usually as disappointing as when differing types of cultures cross-contaminate. By the way, if you haven't already grabbed our FREE Fermenting Formulas Cheat Sheet, go here to do so. You'll get tried-and-true formulas for all kinds of ferments! What If You Don't Have Enough Room? Laurie, you mentioned this is a challenge for you because your kitchen is small. A shelving system doesn't solve this unless it's tall enough that when you put one ferment on the top shelf and one on the bottom, there is 4 to 5 feet between them. Space ferments as far apart as you can. Never keep your sourdough starter near other ferments, especially cheese or other culturing dairy. Move some ferments into another room… a pretty crock or vessel full of colorful vegetables can become a temporary decoration! Our kitchen has 3 “corners” and I have ferments in each one: Kombucha in one, kefir in another, and sourdough in another. I have an additional area — the island counter in the middle of the room — where I keep vegetable ferments. It's at least 5 feet away from each corner. This is what's going currently; we change it up from season to season depending on what's culturing. In the past, when we had a smaller kitchen, I kept some ferments in the dining room or living room that were adjacent to the kitchen. We had to make it work! What arrangement do you use to keep your ferments spaced far enough apart? Do you break some rules and still get good results? We don’t know. 🙂 It’s a photo we have permission to use and we’re not sure what is in it… it does look delicious, though! So how do you remedy raw milk kefir and kombucha cross contamination that has already happened? You can’t save a finished ferment that’s been cross-contaminated. If it’s the culture, though, you could give it more time to get back on track through future ferments (spaced far apart). If your kefir is in a closed jar (plastic lid), then can you keep it closer to the continuous brew (cloth covered) kombucha so they can share the same warming mat. That would be my question, too. I was afraid of that! My ginger bug developed a scoby and it is probably 2 to 3 feet from my combucha. The combucha looks to be ok, but how do I know ? guess next taste will tell. The veggies I keep in the basement, there is not all that much space though, especially come cold season when all my plants have to move indoors again. What does the scoby in your ginger bug look like? I’m working on a ginger bug right now and it’s milky white on the bottom. I had it near a milk kefir… Wondering if it’s from cross contamination or if it is normally whitish on bottom. This is my first ginger bug. I was amused that Wardee had yeast in her cheese as I had the exact opposite issue. I was using wild microflora to ferment some simple cheese from raw dairy. My sourdough jar was above the sink where I was straining the cheese. Two weeks later my sourdough jar smelled cheesy?! Had to throw it out! I will never keep sourdough or any ferment near my sink again. Thanks for this very useful information! Much appreciated too! 🙂 Cool! How long do the microbes last? I have fermenting corner that I continually switch up. Is a few hours between yogurt and Kombucha ok? It is unknown and can vary widely how long the microbes can live in an area. Some cooks make it a rule to separate sourdough and cheesemaking by a day if not a few days. It will take some trial and error to determine what’s a ‘safe’ time between your ferments. What if you’re using airlock lids like the ones from NourishedEssentials? They keep all air out while allowing CO2 to escape. I’m working on a ginger bug right now and a sauerkraut and they’re both milky white on the bottom. I had them near a milk kefir… Wondering if it’s from cross contamination or if it is normally whitish on bottom. These are my first ginger bug and sauerkraut. We recommend 5 feet between ferments so if they are closer it could be cross-contamination. It’s a white substance on the bottom. You might have a cross-contamination situation, then. It’s possible you’ll need to restart each ferment and keep them as far apart in your kitchen as you can — at least 5 feet.